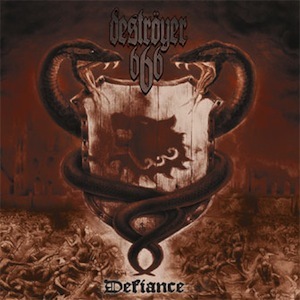 DESTRÖYER 666 are engaging on a new campaign of “Defiance”. The fourth full-length album of these warheads overwhelms all resistance by massive strikes of crushing riffs and constantly pushing guitars that have been a trademark of the Australians since their debut album “Unchain the Wolves” (1997). The band starts out in 1994 as a solo-project of BESTIAL WARLUST guitarist KK Warslut and quickly gains international attention as well as critical acclaim. After some changes in the line-up the band releases “Phoenix Rising” (2000) on Season of Mist. This album adds a pounding barrage of the hammering rhythm section to their sound, which prepares the ground for fast advancing songs. Following a tour with IMMOLATION and DERANGED the members relocate to Europe in 2002 and record their third strike “Cold Steel... For an Iron Age” in the same year. This musical equivalent of Blitzkrieg tactics stresses the Thrash aspect of their blackened sound. Now DESTRÖYER 666 return to a more melodic offensive supported by excellent dynamics. “Defiance” executes their attack with a mastery that reveals the expertise of long serving veterans in the field. DESTRÖYER 666 are redefining the extreme Metal genre with melodic hymns of stunning atmospheric density. Join the unstoppable advance of “Defiance” or be swept away into oblivion!